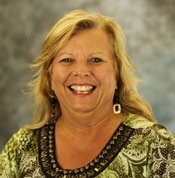 Mary Jo has lived her entire life in southeast Nebraska, she received her Nursing degree through Southeast Community College - Beatrice/Falls City in 2006. Prior to working here she was the school nurse for Falls City Public schools for 8 years and before that she had been employed at Family Medicine Clinic in Falls City. She is in the process of obtaining her American Red Cross CPR instructor certificate. Mary Jo lives on a farm near Verdon, NE with her husband Jim of 26 years. They do row crop farming as well as raise cattle and horses. Jim also is a Rural Mail Carrier in Pawnee County. They have two grown children; Michael 25 lives in Plattsmouth and works in Omaha as a Certified Public Accountant, Michael recently got married this June to Aimee and Cord 22, graduated this May from Northwest Missouri State with a degree in Animal Science-Pre Vet, he will start graduate school in August at University of Missouri in Columbia to obtain his degree as a Veterinarian. In her spare time she enjoys time with her family and friends. She enjoys traveling, being outside and golfing.